At just 23 years of age, Luke Schenn has yet to prove he’s an elite NHL defenseman. Drafted fifth overall by the Toronto Maple Leafs in 2008, he was hyped as the next big thing on the blue line – the type of player that a franchise could build its future around – but that hasn’t exactly been the case. At the time he was drafted, Toronto was desperate to find a high marquee player that would bring life back to the franchise, which has failed to make the playoffs since 2003. The team expected him to become one of the best in the league within just a few seasons, especially after his impressive performance at the 2008 World Junior Championships. Building from the defense up, the Maple Leafs already had three-time All-Star Tomas Kaberle and believed they could construct one of the better defensive pairings in the league, not to mention all that Schenn could learn from a guy like Kaberle, who had been through plenty of ups-and-downs in Toronto. Schenn is a stay-at-home defenseman that won’t show up too often on the scoresheet, as his style is more of the preventative type. At 6-foot-2, 229 pounds, he’s considered small for his position but that doesn’t keep him from playing physical. He plays smart and tough, knowing exactly what his responsibilities are on the ice – but sometimes he tries to do too much with the puck. The transition to the NHL was difficult for Schenn and it took time to adjust his game, especially after spending the previous three years playing internationally and in the WHL. The Maple Leafs simply threw him to the wolves, as he probably should have spent his first season with the team’s AHL affiliate – the Toronto Marlies. It would have given him time to mature his game and better prepare himself for playing in what is perhaps the biggest hockey market in the world. 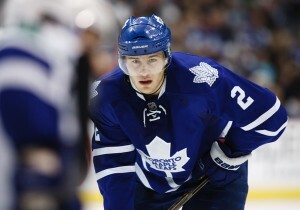 But at the time it seemed to be the right move for both Schenn and the Maple Leafs. After four inconsistent years with Toronto, the Leafs decided it was time to move on and began to shop the once highly-touted defenseman. He was traded to the Philadelphia straight-up for left winger James van Riemsdyk, a guy who – being drafted second overall – was in a similar situation. The trade was somewhat of a head-scratcher for Philadelphia. Although the Flyers needed help on the blue line, the team saw glimpses of what JVR was capable of, especially during the first round of the 2011 playoffs against the Buffalo Sabres. The change of scenery might be good for both players and in Schenn’s case, being united with his brother Brayden could provide an additional boost to his game. The Flyers are expecting a lot from their new defenseman, who could be an important role player if the team plans to find any success this lockout-shortened season. He’s still young enough to work out the kinks in his game before he hits his prime but he’ll have to seize this early second chance. He’s got his work cut out for him, though. Goaltending has long been a issue with the Flyers and although it appeared to be contained after the signing of Ilya Bryzgalov in 2011, it’s once again become a media circus. The defense is that much more important because Bryzgalov can become unhinged almost overnight, as we saw last season. But things haven’t gone well for the Flyers’ blueliners recently. Last year was a devastating one. The team’s best defenseman – and future Hall of Famer – Chris Pronger suffered a concussion and appears unlikely to ever play again. It proved devastating for the team as the defense looked clueless at times during the playoffs. The Flyers still have Kimmo Timonen but at 37-years-old, it’s unclear just how much he’s got left in the tank. Last season it appeared as though logging all that ice time was taking a toll on Timonen, who looked worn out by March. Braydon Coburn is the only one for whom you know what you’re getting. He sometimes has lapses in judgment when making outlet passes but for the most part he plays an all-around solid game. At times he shows moments of tenacity and plays with some bite – if only he did it all the time. The Flyers also have a couple of young, talented defenseman in the likes of Erik Gustafsson and Marc-Andre Bourdon but neither is seems ready for a high-impact role and have battled injuries this season in the AHL. So that leaves one aging former superstar, a guy nearing a return from an achillies injury, two potential high-impact players and then Coburn, which is why Schenn will need to play like a fifth overall draft pick. He’ll need to log significant ice time each night and play a consistent brand of hockey, something he failed to do in his four years in Toronto. He will have to step up and realize his role with this team, as well as his importance. The move to get Schenn could prove to be genius for the Flyers if he comes into his own. Otherwise it could be costly if he turns out to be a big-time bust.